I LOVE oysters. This is surprising because I hated them as a kid and when I tried my first raw oyster in the mid-90s (at the London Beer Show) , I got violently ill. Instead of putting me off of oysters for life, I fell in love with them and even did an in-depth study on oysters and pearls in literature for a senior thesis at university. No one loves oysters as much as my friend Jacqui, who can knock back more raw oysters than anyone I know. Jacqui was also the friend who introduced me to some of the best oysters I ever had in my life, straight from Barilla Bay farm near Hobart, Tasmania. We have gorgeous oysters in South Australia as well, especially from the Eyre Peninsula. Just remember that oysters tend to spawn in the summer and if you happen to eat them in the summer, you may notice a creamier texture (which I do not like at all). Most people would agree that they are at their best in the winter. 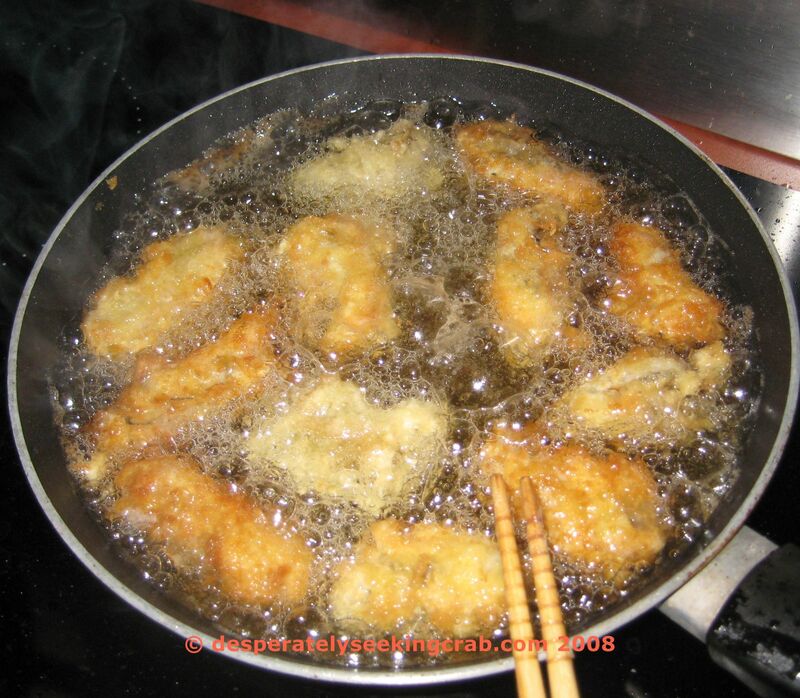 Deep-frying oysters is also delicious. 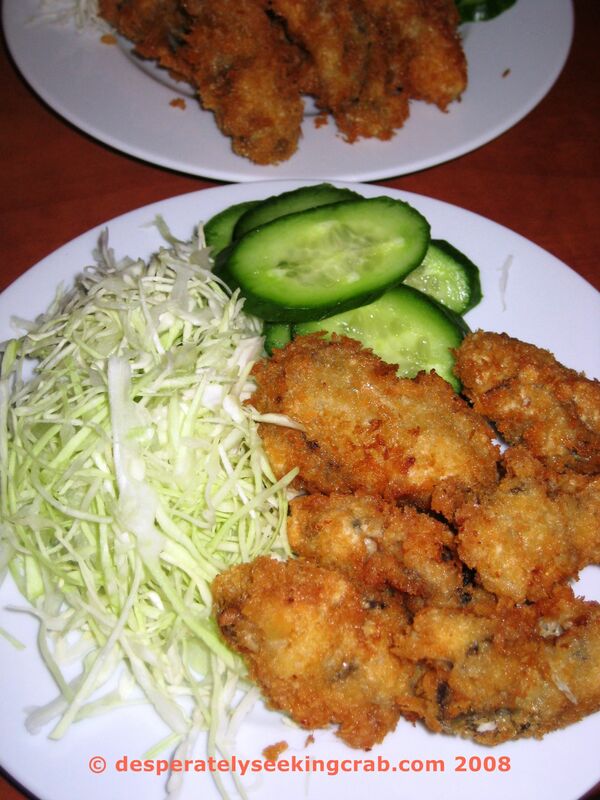 In Japanese restaurants you’ll often see it sold as “Oyster Fry” or “Kaki Fry” (Kaki has a double meaning of both oyster and persimmon in Japanese). The recipe is super easy and there is no measuring that needs to be done. Shred cabbage very thinly by hand or with a mandolin. Divide between serving plates. It is meant to be eaten with the fried oysters. Put raw oysters in a bowl and rinse with cold water (you can use salted water but I don’t think it’s necessary). If you happen to have some grated daikon handy, you can also use the daikon to “rinse” the oysters and then rinse with cold water. Pat dry with paper towels or tea towel. Put about 1/2 cup of flour on one plate, a cup of panko on another plate and beat an egg (w/a couple of tablespoons of water) into a separate bowl. Meanwhile, start to heat the oil. Season the oysters with a little salt and pepper. Then get yourself situated so that the closest plate to the hot oil is the panko, then the egg, then the flour. 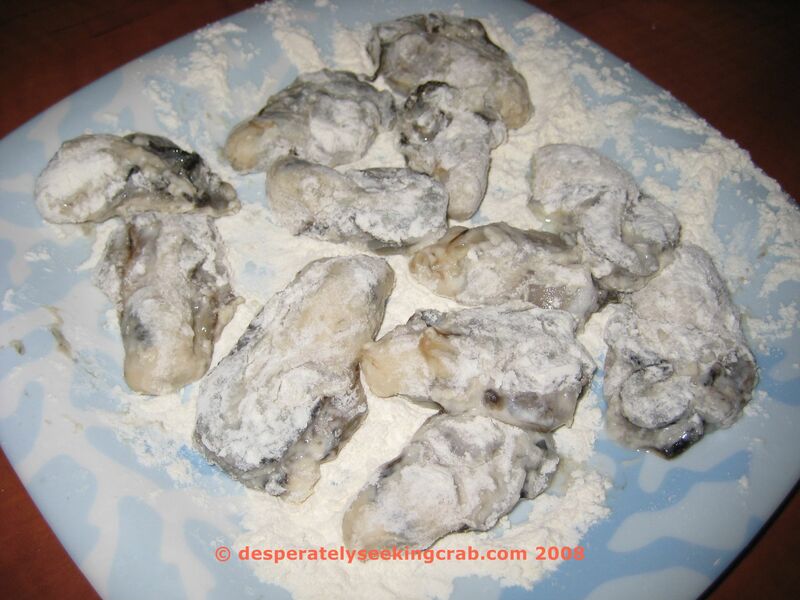 Roll as many oysters as you can into the flour to coat and before dunking them into the egg, dust off excess flour. Once coated with egg, dip them immediately into the panko and dunk straight into the hot oil. If you start running out of flour, egg or panko before finishing all the oysters, just simply add more to finish off. I’m not an oyster lover (I have to be in the right mood), but these are really good. The panko is very important because it makes the coating very light and crispy, completely unlike the batter you might use to fry fish in. I’m not an oyster fan (don’t love, yet don’t hate ’em either), but panko-breaded, deep-fried ANYTHING is usually oishii, so I must try this! On top of that, it uses Tonkatsu sauce, which will be interesting to find out how that compliments an oyster, which is different from pork on so many levels. Good to see you put shredded cabbage on the side. Shoot, just that with Tonkatsu sauce is great! ha ha. Seriously, sometimes when I eat Tonkatsu, I like to take a break from the heaviness of the Tonkatsu and just eat the cabbage with sauce poured on it. Is the cucumbers on the side pickled like Tsukemono, or plain? I love the Namasu-style cucumbers. We have a local company that sells that in the store. In fact, I need to go buy another container. I’d probably also add a few slices of Daikon to the dish. Oh Michelle, you should try Beni Shoga (pickled Ginger) with Tonkatsu next time you make that. It’s awesome! It cuts right into, while complimenting the pork katsu like a charm, kinda’ like pairing it with a good wine. Thanks for all the comments Pomai! I’m just like you, I like to eat cabbage with the tonkatsu sauce poured on it too! The cucumbers on the side are fresh, plain. 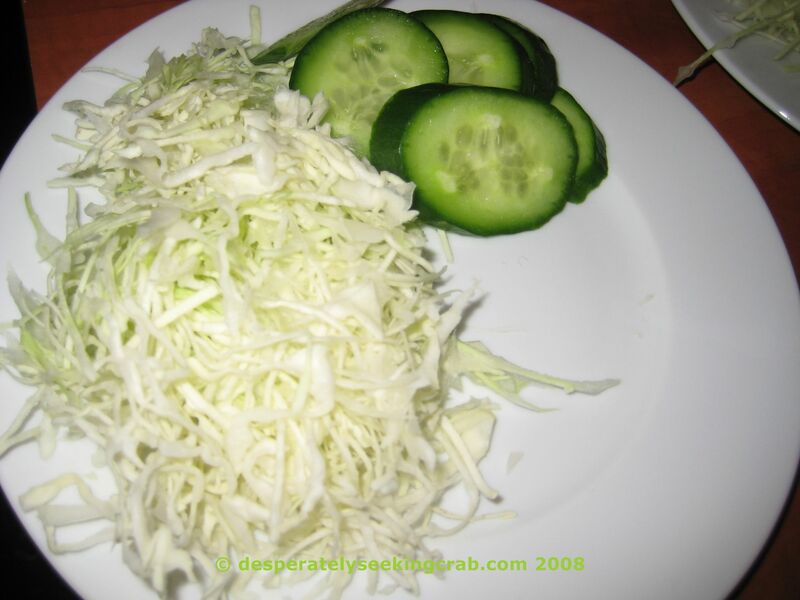 Namasu is great and easy to make at home, you should try it some time.